Road bikes have evolved with the addition of thru-axles and disc brakes. Road bikes are much more versatile and are able to ride more comfortably and farther than ever before. 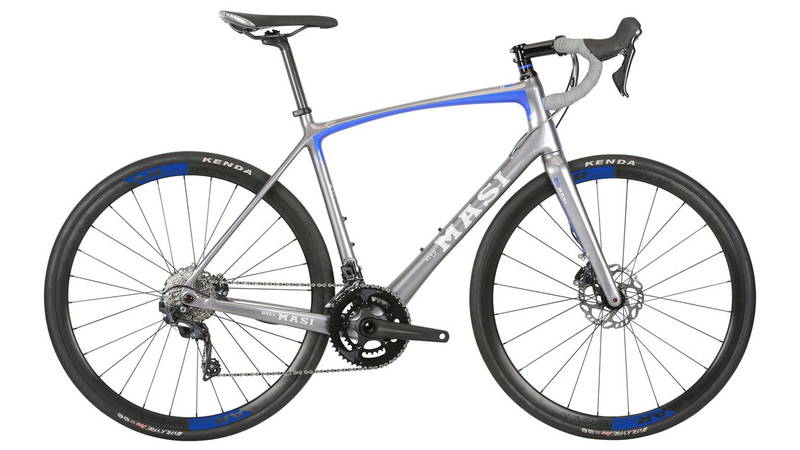 The Masi Vivo RS Bike is a carbon fiber framed road bike that is built for comfort and long distance riding. It features a comfort tuned MC9 carbon tapered fork that has removable fender mounts. The Vivo RS has a 2x11 Shimano Ultegra R8020 drivetrain that includes the shifters and front and rear derailleurs. Shimano's Ultegra shifts incredibly smooth and is regarded as one of the most reliable drivetrains on the market. The gearing on the Vivo RS makes it easy to climb steeper hills while also providing ample gearing for long distance riding. The Shimano Ultegra R8070 hydraulic disc brakes provide unmatched stopping power that many riders love. The Brev M AR21 wheels are tubeless ready so you can set them up with tubeless tires and sealant for a smoother ride and fewer pinch flats. If you're looking for a road bike that can take you just about anywhere, then you'll love the Masi Vivo RS Bike. 152.5 - 162.5 cm 5'3" - 5'7"
167.5 - 175 cm 5'8" - 5'11"
172.5 - 180 cm 5'10" - 6'2"
177.5 - 187.5 cm 6'2" - 6'5"